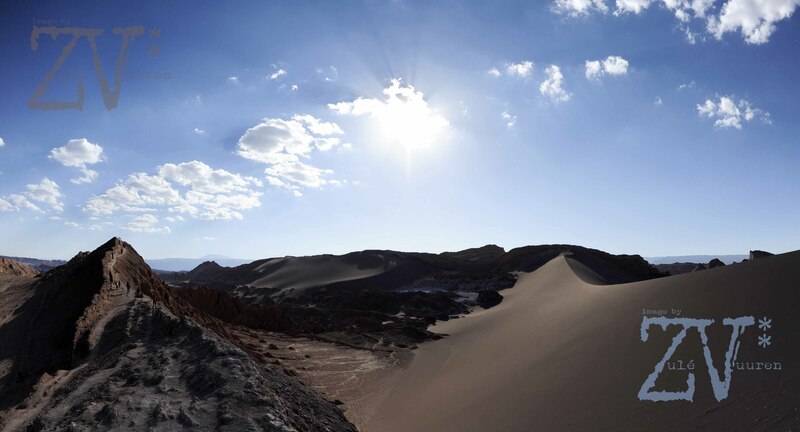 2 – 5 March ’14 – Golden Sands of the Driest Desert in the World! After spending our last morning in the colourfulness of LAB00, greeting our hosts and promising to meet again somewhere across the world, T and I load our luggage and make our way slightly up the hill to catch the little town bus that will take us to the bus station below. We squash ourselves and our luggage into the front of the little bus, standing by the open door, holding on for dear life. Swerving through the hills at a surprising speed for a full bus. I really hope we get there soon because I might just fly out the door at the next turn! We make it alive to the Valpo Bus Terminal where we would ideally like to catch a bus that goes directly to San Pedro de Atacama. Now every guide book you read will tell you that there is a direct bus, many web forums too – THEY ARE ALL LYING! 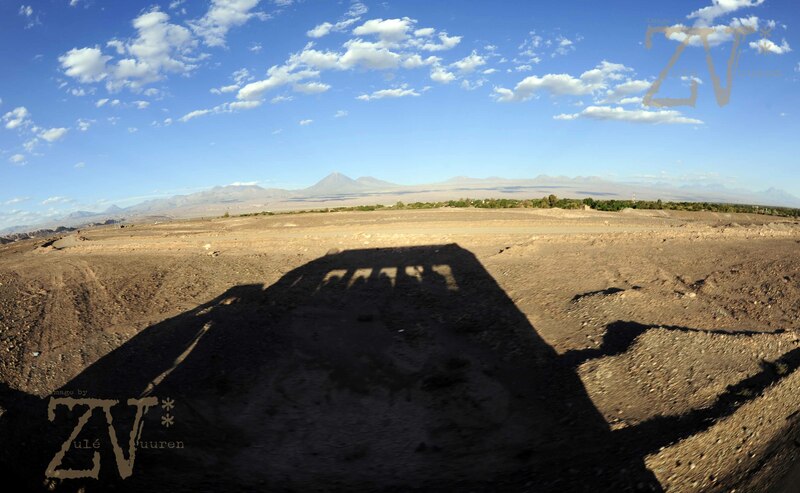 Our best bet is to take a bus to the town of Calama and from there catch a bus to San Pedro. There are however only 2 bus companies that go this route, Buses Frontera and Atacama 2000, and they only go once or twice per day, so timing is everything! Wow! What a long bus ride! We make it to the copper mining town of Calama in about 24 hours – an entire day out of my life that I can never get back. The ride was quite comfy, and the changing landscape an amazing sight to see. From beach to desert, and a whole lot of nothingness in between. 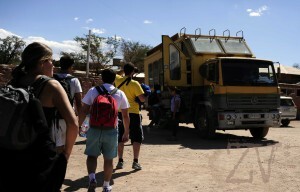 Calama is a big town and miners from far and wide flock to it in search of work. It doesn’t have much to offer the adventuring traveller, except as a quick stopover on the way to San Pedro de Atcama. The next trip is at 13:00 at 3000 pesos each. The desert town is just about an hour away, smack bang in the middle of the Atacama Desert – the driest desert in the world. As the town streets change to sand streets and all we see around us is orange and golden hues for what seems like endless miles, the town of San Pedro de Atacama shoots up from the sand in an oasis of green – a welcome sight amongst the sand. The Atacama 2000 drops us at the ‘Terminal’, which is nothing more than an open lot with a small adobe building to the side. If it wasn’t for the long parking bays giving it away, you would never have known it was a bus terminal. It’s next to the big Artisan Market, in case you were wondering..
A short (and useless) taxi/bakkie ride plus a long dusty walk with our wheely suitcase in the sand later we find our hostel on Lincancabur Street – Rincon San Pedrino is a decent little place with big rooms, hot water most of the time and temperamental wi-fi. This little town is purely made for tourists – it’s a pretend place, roads left unpaved for effect more than the case of not being able to afford it. It has that same touristy feel to it as Puerto Iguazu, Argentina. Only hostels, restaurants, curio shops and tour operators line the streets. The actual Chileans who live in this town live on the other side of the football field, in the direction of the big Volcano – yes, an actual volcano. We stroll around town, hearing English almost everywhere..not ideal, but what else can we expect. When travelling on a whim and a dream and a desire for adventure it is inevitable that you will want to see places that dozens or even hundreds and thousands of other people also want to see, at the same time. It takes from the romanticism of the journey, but if you are prepared for this it doesn’t come as such a disappointing shock. Our Grado 10 Transporter on the go! 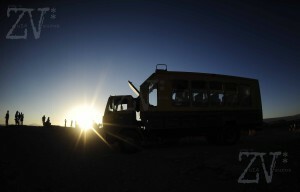 San Pedro is the starting point for a wide range of desert excursions. 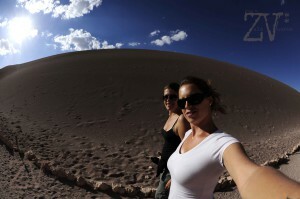 Hence all the tour operators.. We spend the morning finding the best deal for a daytrip to Valle de la Luna (Moon Valley). There are many magnificent tours to take for varying prices, but if you like us only have one day and you are on a budget I would suggest the Valle de la Luna day trip. Most companies do a morning, afternoon and night time trip for between 8000 and 14 000 pesos. This does not include 2000 pesos entry fee to the National Park where Valle de la Luna is situated. We decide on Grado 10 Tours for our 5 hour desert sunset trip. They are a mid-range company (10 000 + 2 000 pesos) and are set apart from the rest by their truck/bus hybrid transporter that makes all the other operators’ little buses look super boring! Golden Sands – alot of it! We meet at the Grado 10 Office on Tocanao St along with 20 or so others. Claudia, our guide, ushers us to our vehicle and we set off into the nothingness toward that Volcano. Everyone else on the tour is Spanish speaking (and understanding) and Claudia has to repeat all the important bits in English especially for us. 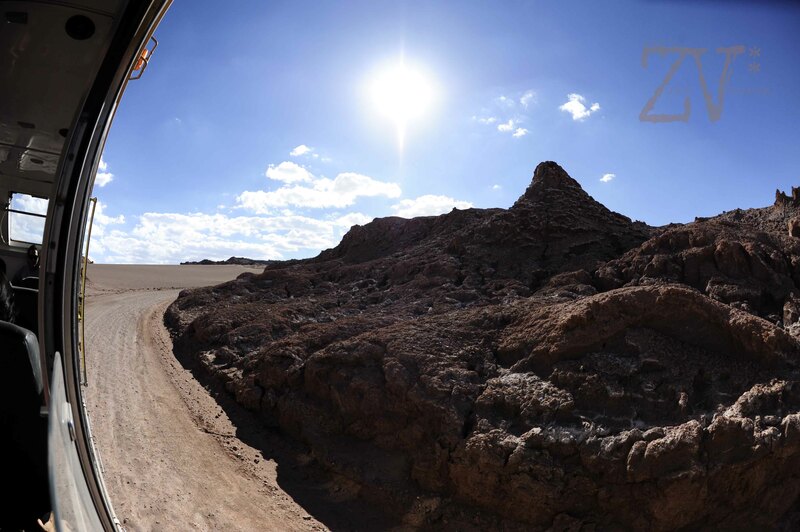 Our truck bounces along the desert roads and our first stop is to trek a canyon. Seeing rock formations that constantly change due to wind and water altering the soft minerals is extraordinary. The landscape, colours, shapes and textures are all otherworldly – like the surface of the moon. We climb through caves and up cliffs, marvelling at the vast expanse that is this desert landscape. The clear sky above a soft blue, the sun reflecting golden on the sand. Once again I am reminded of how small I am in this wide universe that is my home, yet I am able to have a tremendous effect – like one little desert stone inside my hiking boot. We move along in our truck to climb La Grande Dune (The Great Dune). 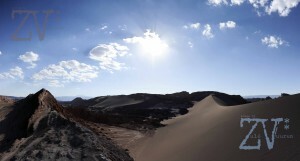 It is the highest dune in this desert and needs a great amount of energy to make it to the top. My calves are getting a much needed work out. And it is definitely worth it – The sight from the top is breathtakingly indescribable! Like nothing I have ever seen before.. an ocean of golden light stretching out into the endless distance. Mother Nature is the only true artist. 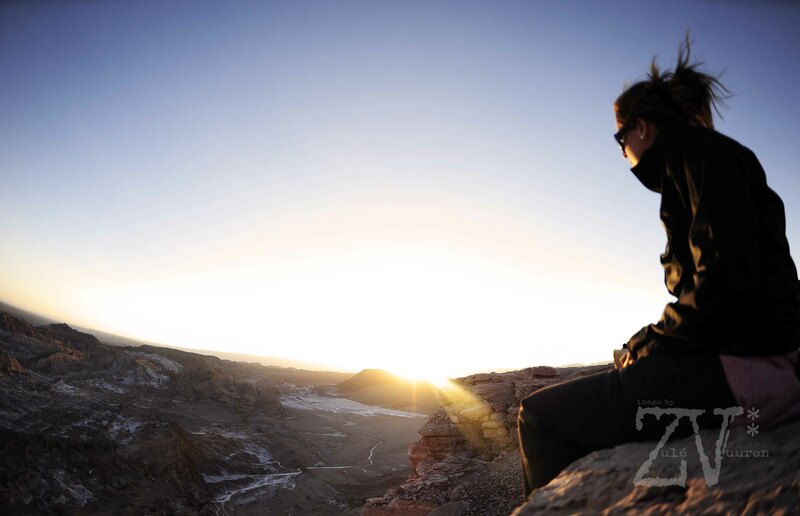 We watch the sunset over Valle de la Muerte (Death Valley) and as the sun slips away beneath the sand I am once again amazed at the journey we have had so far. We have witnessed the magnificence of nature, experienced the kindness of strangers and felt the rhythm of souls connecting through sharing stories, art, food and mostly laughter! We have grown stronger and wiser as a couple and we’ve become better human beings, as a whole, on this trip. There truly is no better discovery in life than the discoveries travel brings. This is the best gift we ever could have given ourselves, and each other. This entry was posted in Chile, Travel and tagged 10, adventure, Atacama, border, caves, Chile, clay, cliffs, day trip, de, desert, dune, Grado, la, luna, muerte, salt, San Pedro, sand, valle, volcano.